How a wealth management firm used Salesforce to increase productivity. Tracked ROI for a large international firm that used Salesforce to streamline processes. Reduced IT maintenance costs. Eliminated many existing applications by migrating their functions and data into Salesforce. Improved client service and reduced response times with centralised access to client information. Accelerated time to market. Development team can create, test, and deploy apps that used to take weeks in just 24 hours. 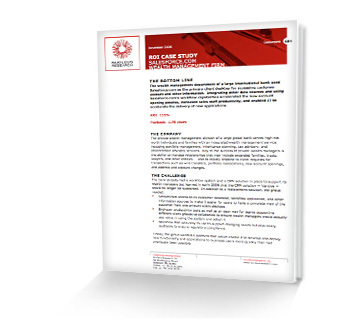 Download this Nucleus Research ROI Case Study to get full details on the increased productivity and decreased costs created by Salesforce.